Casimiro Lozano La Rio 1A Model Classical Guitar (2002), made in Spain, natural varnish finish, Brazilian rosewood back and sides, German spruce top; Spanish cedar neck with ebony fingerboard, original molded black plastic hard shell case. This lovely concert guitar is the work of luthier Casimiro Lozano Carillo, who works alone in a small shop in the town of Cuenca in rural Spain. As might be expected it is a very traditional guitar, built entirely by hand of extremely fine aged woods; Brazilian rosewood for the back and sides and German spruce for the top. Lozano, born in 1954, is a lifelong guitar builder having apprenticed beginning at the age of 15 at the shop of Vincente Carillo in the town of Casasimarro. His guitars are based on the Fleta pattern but incorporate his own continual evolution of the design. This instrument is an example of his finest A1 grade concert guitar, 10 years aged and in practically unplayed condition. The sound is deep and robust and the workmanship very fine; a beautiful modern representation of traditional Spanish lutherie. Overall length is 39 3/4 in. (101 cm. ), 14 1/2 in. (36.8 cm.) wide at lower bout, and 4 1/4 in. (10.8 cm.) in depth at side, taken at the end block. Scale length is 25 3/4 in. (654 mm.). Width of nut is 2 1/8 in. (54 mm.). 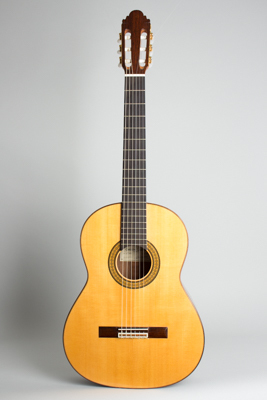 Practically new, never played; an extremely fine example of a modern but thoroughly traditional, handmade Spanish concert guitar. Near Mint Condition.